Is 'Star Wars: Episode 9 - The Rise of Skywalker' Trying to Undo 'The Last Jedi'? When we get to the end of the year and this new trilogy of “Star Wars” saga films comes to a close, it’s gonna be really fun to take a big picture look at how this story played out — especially if what we’re taking away from the trailer for “Star Wars: The Rise of Skywalker” is an accurate read on what the finished film is like. Because, on the surface at least, it very much looks like the film wants to abandon whatever “The Last Jedi” was setting up, thematically. The first two installments in this trilogy — “The Force Awakens” and “The Last Jedi” — already have a pretty rocky relationship with each other. “The Last Jedi,” written and directed by Rian Johnson, seemed determined to ditch whatever JJ Abrams had in mind when he wrote and directed “The Force Awakens.” Especially big “TFA” mysteries like Rey’s (Daisy Ridley) parentage and the identity of the super weird Supreme Leader Snoke (Andy Serkis). “Let the past die. Kill it if you have to,” Kylo Ren (Adam Driver) said to Rey after he casually murdered Snoke as if he weren’t a hugely important character, then told her that her parents were nobodies. “The Last Jedi” is so often like that that it can be tough to track it and “TFA” as one story. The fact that Lucasfilm let Johnson make a movie which so thoroughly disregarded its predecessor made the studio’s decision to turn around and bring back “TFA” director JJ Abrams to handle “Episode IX” even more curious. 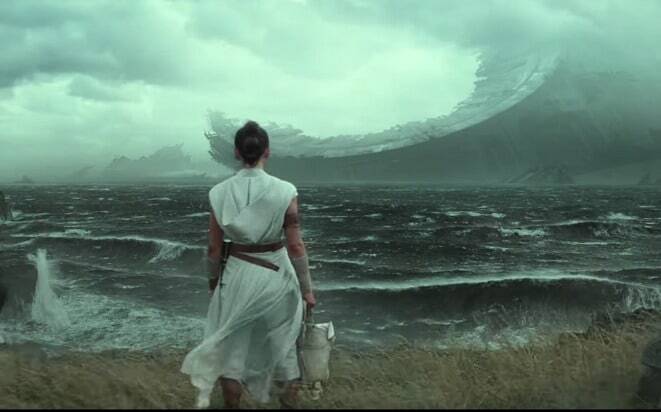 I wondered if it meant they were going to undo the undoing, so to speak, and the first “Star Wars: The Rise of Skywalker” trailer sure makes it look like, yes, it really is going there. I could be wrong! I have been wrong many times in my life, and this could be one of those times. But I also have been right many times in my life, and this could be one of those times. We’ll find out in December for sure, but for now let’s look at the evidence. The first thing that immediately screamed at me is Kylo Ren’s helmet being repaired. 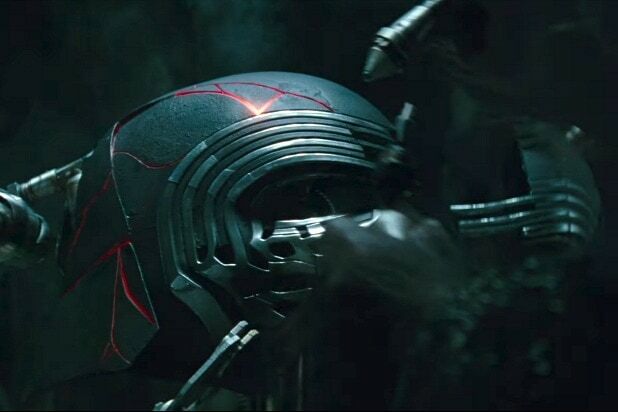 That helmet was symbolic for how “TLJ” just wanted to go the other way with things after “TFA” — early on in the film Kylo Ren takes off the helmet and smashes it to pieces, and just never wears any kind of head gear again. But here’s that helmet again, being patched together by unknown alien hands. Is the helmet a metaphor for how “Star Wars: The Rise of Skywalker” is going back to Abrams’ original plan for how this trilogy was going to go? With so little to go on, that’s the vibe I’m getting from that shot. Why else include it here if not as some kind of statement of thematic intent? I got the same vibe, later, from Luke Skywalker’s (Mark Hamill) narration at the end of the trailer — “No one’s ever really gone,” he says, which, alongside two other bits from the end of the trailer, feels like a callback to Kylo Ren’s “Let the past die” line. The past of the “Star Wars” franchise is extremely alive in this trailer — Rey, Finn (John Boyega) and Poe (Oscar Isaac) visiting the wreckage of a Death Star, which Luke’s line plays over, and the long-dead Emperor Palpatine’s laughter over the title card being another. Both of those things are major throwbacks to the past, particularly if Palpatine is somehow alive or has been resurrected. Having Palpatine be involved in this movie in any kind of tangible way is the opposite of letting the past die. It’s literally bringing the past back. Plus, “TLJ” casually discards the character standing in for the Emperor, and then “Rise of Skywalker” just casually brings back the actual Emperor? That would be some serious one-upmanship. Is all this a lot of guesswork based on a trailer that lacks any kind of plot substance and inferences based on who made which movie? Yes! We still don’t actually know what the plot of this “Star Wars: Episode IX – The Rise of Skywalker” is. We don’t even know what that title means. It’s a classic JJ Abrams mystery box situation, and articles like this one are all part of that game.